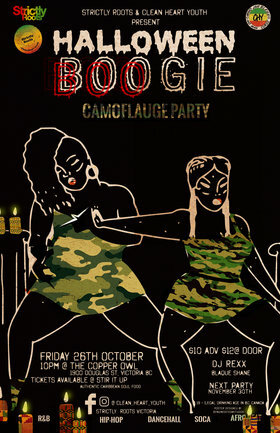 Strictly Roots & Clean Heart Youth present Halloween BOOgie Camouflage Edition on Friday October 26th 2019. DJ Rexx and Blaque Shane bring you the best in DANCEHALL, HIP HOP, RnB, AFROBEAT @ The Copperowl, 1900 Douglas Street. Get $10 advance tickets at Stir it Up Authentic Caribbean Soul Food / 760 A Yates Street, $12 at Copperowl . Doors at 10 pm. Come dressed to impress in your best CAMO GEAR.